It’s not very funny at all, but this movie still manages to find some personality and a plot that is just interesting enough to keep us watching. The Dilemma never looked any good from the previews and there are two good reasons for that. The first is that nothing in those previews looked funny at all. 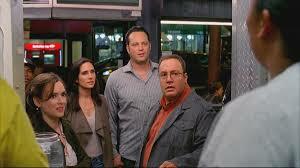 Vince Vaughn giving Kevin jams the speech from the movie victory during a cab ride, and then jams calling him on it. Not funny. Neither is anything else. And the second reason why the movie didn’t seem like it would be any good is because the plot seems like something we’ve seen before. Again and again. You catch your best friend’s wife cheating on him. Do you tell him? Of course you do. It’s really a no-brainer, but if you make that decision and tell your friend, then you really have no movie. So of course Vaughn’s character, Ronny, is going to spend the film debating on whether or not he should tell his buddy. Between what looked like a terrible plot and what looked like a bunch of unfunny jokes, this movie appeared as if it would be a disaster. Especially considering that neither of it’s two stars has had a healthy track record lately. Vaughn’s recent attempt at comedy in couples retreat turned out to be absolutely awful, and James might have become a big movie star because of his pairings with Adam Sandler, but none of their movies together were very good. His most recent one, grown ups, was probably the worse of all. But there are some very clear reasons why those two movies failed and why the dilemma (while not being anything great), is still miles above them. Both of those movies were ensemble films featuring large casts and both had screenplays and plots that seemed like they were put together just as an excuse to get these actors all in the same film. Like a bunch of friends decided they wanted to work together and asked someone to write a screenplay that would allow them to do that. 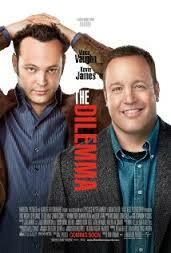 The Dilemma is a far better film and that is simple because it is well made. Credit that to director Ron Howard who rarely makes comedies. One of his only attempts was the movie Splash, back in 1984, and it turned out to be a comedic gem. The Dilemma might not be anything close to that, but it is still a lot better than it looks. The movie is indeed about Ronny seeing Nick’s wife, Geneva (Winona Ryder) out with another guy, smooching all over him. That guy is an airhead named zip, played by Chaning Tatem. And Ronny does spend the rest of the movie debating about whether or not to tell nick. But they also have other things going on. They have a major deal with a car manufacturer, which brings in Queen Latifah and a few strangely sexual ratings. Then there is also the situation where everyone is telling Ronny that he should propose to his girlfriend, Beth, and is on the verge of doing that until all of this other stuff goes wrong. That other stuff includes Ronny taking a nosedive into some poisonous plants and getting a massive rash all over his face and body. It also includes him trying to take photos of Geneva and zip and ending up in a fistfight with zip outside on the street. And Beth might not know what her boyfriend is into, but she can certainly tell that something isn’t right. The movie saves a nice little surprise of back-story between Beth and Ronny and something they’ve had to deal with in the past, that makes his not telling her what’s going on, all the more complicated. The movie is helped a great deal by the zip character. He only shows up about half way into the film or so, but he is by far the liveliest and funniest character on hand here. Aside from Ronny, he’s probably the only one I like in the movie as well. That’s because he’s sensitive and has a heart. Yes, he’s helping a wife cheat on a married man, but like he says, “it takes two.” Between he and Geneva, he is not the one doing the cheating, and he seems to even feel bad about it. At a certain point, the movie does run out of steam, and unfortunately it’s before the climax. Once the secret of what’s been going on has been let out of the bag, there shouldn’t be a whole lot of movie left. And I guess there isn’t, but a final scene on the ice at the hockey rink is kind of a waste, and nothing really gets resolved that wasn’t already settled before. There are two good things about The Dilemma. One, of course, is the character zip and how he is the exact opposite of any villain or antagonist we might have expected. But the other funny thing about the movie is the way that Ronnie tells Beth made up stories to explain why he looks or is acting a certain way, and they are always ridiculous. One involves a bar fight. My favorite involves him having to reach under some “street plants” to help get a ball for some fat kids. We even get to see him trying to get the ball for these kids, even though we know the whole thing is made up. And hearing Beth question how ridiculous these stories and Ronnie stick by them with conviction, is a lot of fun. The movie is not good, but at least there are some redeeming elements, and it’s not as bad as it looked.